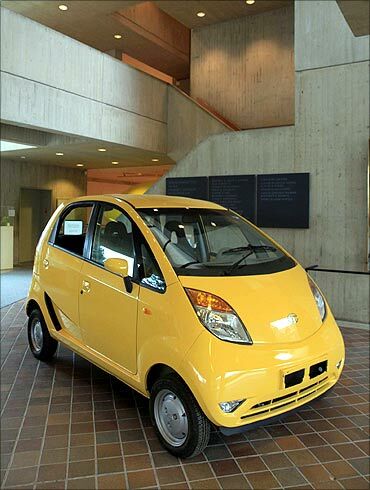 The Tata Nano, the world's cheapest car, could be cruising on Pakistani roads if the governments of India and Pakistan remove bottlenecks standing in the way of joint ventures and investments between the two countries. 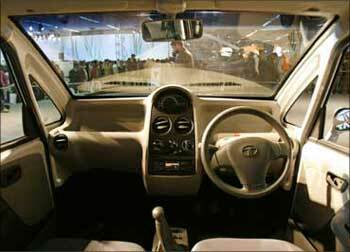 The International Multi Group of Companies, a Pakistani business house with interests in areas as diverse as edible oil and film imports, has expressed the interest in importing vehicles from India's Tata Group, including the Tata Nano and CNG buses. "We already have a letter of intent with the Tata Group as we were interested in their CNG buses. At a later stage, if restrictions in the trade policies of both India and Pakistan are removed, we are interested in bringing the Nano to Pakistan," IMGC Global chairman Amjad Rashid told PTI on Wednesday. IMGC's plans to import CNG buses from Tata have been held up due to restrictions in Pakistan's trade policy, which allows the import of only a limited number of vehicles and makes it mandatory for a majority of vehicles to be assembled within the country. At the same time, the policies of the Reserve Bank of India do not allow joint ventures and investments in Pakistan. "We raised these issues with Indian commerce secretary Rahul Khullar when he was in Islamabad last month for talks with the Pakistani commerce secretary and he promised to get these restrictions removed," Rashid said. 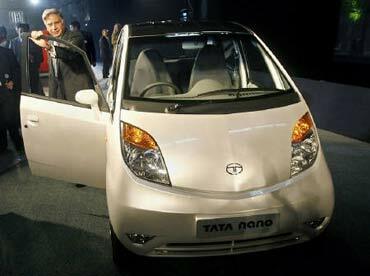 Image: Tata Group chairman Rata Tata with the iconic Nano. 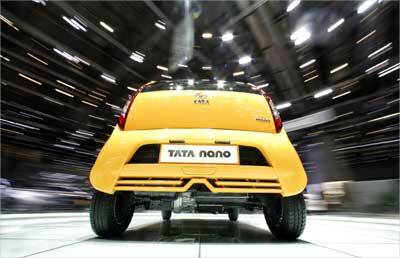 Rashid said his group, which has an annual turnover of about $200 million, is keen on bringing the Nano to Pakistan. "That is the ultimate objective. We already have a letter of intent. 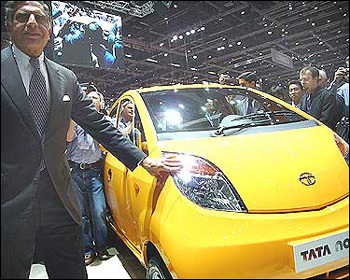 Once the bottlenecks are removed, we would import the CNG buses and the next step would be the Nano," he said. IMGC, one of Pakistan's largest manufacturers of edible oil, is also interested in collaborating in other sectors with the Tata Group, including technology, Rashid said. The group is also Pakistan's largest importer of Indian films. "We brought in 30 Indian films last year and we have signed for 15 more films this year. We are also about to conclude a deal for digital film technology, which will remove the need for importing film prints as movies will be brought in as digital files," Rashid said. A Tata Group delegation that visited Pakistan about two years ago had held meetings with several senior officials and leaders, including the industry and commerce secretaries and Punjab Chief Minister Shahbaz Sharif. 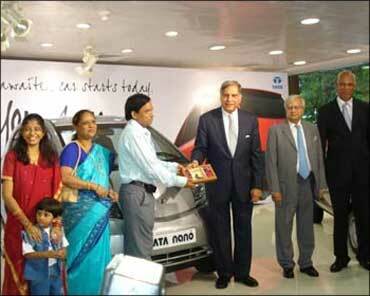 Image: Ashok Vichare, the first owner of Nano, gets the keys from Ratan Tata. The delegation had even expressed interest in donating some CNG buses to Pakistan. However, the Tata Group backed off on business ventures with Pakistan after the 2008 Mumbai terror attacks, when a group of militants targeted several locations in India's financial hub, including the iconic Taj Mahal Palace Hotel owned by the Tatas. The recent resumption of the India-Pakistan peace process has given a boost to several business proposals between the two countries that are in the pipeline. IMGC Global chairman Rashid was among the Pakistani businessmen who participated in several meetings held during commerce secretary Khullar's visit to Pakistan to discuss ways to increase trade cooperation, including permission for joint ventures and investment. Pakistani traders are looking at India as a key market for their products like cement and textiles, while India is being seen as a provider of low-cost technology and products like the Nano, which was launched in 2008 with a price tag of Rs 1 lakh (Rs 100,000).